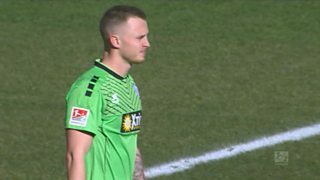 MSV Duisburg goalkeeper Mark Flekken gifts Ingolstadt's Stefan Kutschke a goal in their Bundesliga 2 encounter after turning his back on play to drink from his water bottle. Duisburg thought they had scored, leading to Flekken ambling back to his goal for a quick drink before the game was restarted. However, the effort was disallowed and Ingolstadt counter-attacked to leave the keeper red-faced.